PlentyofreasonstosmileatSparetimeRecreations - Summit Utilities Inc.
As one of the most popular local destinations for birthday parties, group events, or enjoy an evening of fun, Sparetime Recreation continues to put smiles on everyone’s face. In addition to the happy customers, owner Andy Couture is also smiling. Not only are his customers happy, but he is thrilled about the impact natural gas will have on his business. 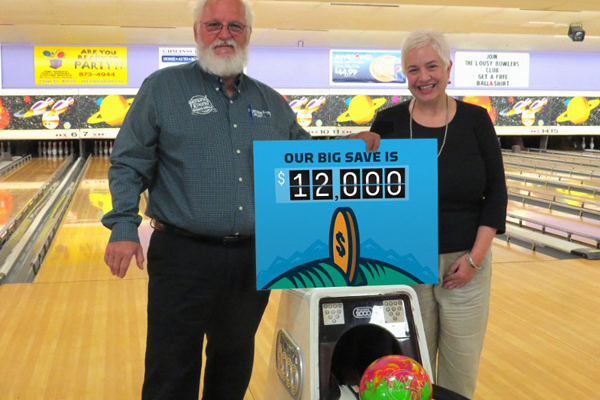 While customers continually rack up high scores in the arcade or on the bowling lanes, it’s the lower energy costs that Couture knows will benefit his customers and the entire community that rack up the high scores for him. “When I heard Summit was coming to Waterville, I knew I wanted to switch as soon as I could. We use natural gas at our location in Lewiston and it has been great. You pay only for what you use instead of buying in bulk, which makes it more cost effective for my business. In addition, natural gas is an efficient fuel, it costs a lot less and the price is more stable,” said Couture. In addition to Sparetime Recreation, Summit Natural Gas of Maine is also serving Inland Hospital and Thomas College, both in Waterville. Residential customers from Augusta, Fairfield, Gardiner, Hallowell, Madison and Waterville are now connected to the Summit pipeline and are using natural gas. In total, more than 1,800 residential customers have already signed up with Summit for natural gas service and to benefit from the efficiency rebates available. “When you think about what Summit is doing and the savings they are bringing to people and businesses in Waterville and in the region, it is a win-win for everyone. The less people have to pay for energy and heat, the more discretionary income they will have and that money is going right back into the local economy, including places like our facility,” said Couture. So what will Couture do with the anticipated annual savings? He says that he will use his anticipated annual savings, around $12,000, to make improvements to the bowling alley, including new TV monitors and carpeting. In the future, he also has plans to pave the parking lot. For all these projects, he says, the money will go to local contractors and businesses. The benefits of natural gas for Sparetime Recreation extend past simply saving on heating bills each winter. Eventually, Couture plans to switch the kitchen over to natural gas to increase his savings.